(Last Updated : 11.04.19). 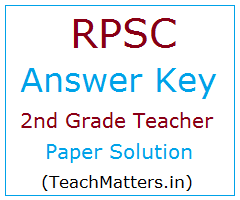 Check RPSC Answer Key of 2nd Grade Teacher Exam 2018 held in 2019. The Commission has released Question Papers & Answer Key of 2nd Grade Teacher Exam 2018 exam held in 2018. Final answer key of 2nd Grade Teacher 2016 exam 2017 was released on 12.02.2018. RPSC Sr. Tr. Grade II Exam 2018 for GK Paper 1 was held on 28.10.2018 & 30.10.2018. Rajasthan Public Service Commission conducted Subject optional Papers Written Exam in October & November 2018 for Senior Teacher Grade II Exam 2018. Candidates who appeared in the exam can check final and official answer key and solved question paper of 2nd Grade Teacher Answer Key 2018 from here. Official answer key has been uploaded by the Commission on the official website of RPSC i.e. www.rpsc.rajasthan.gov.in and candidates can download the same from here. Download here Sr. Tr. 2nd Grade Answer Key 2018. The Answer Key of 2nd Grade Teacher (Saskrit Education) Exam 2018 can be downloaded from here as the official answer keys are available on the official website. Candidates can download official Subject Paper Group-1 answer key as well as Subject Paper Group-2 answer key of Senior Teacher 2nd Grade Exam 2018 held in February 2019. Answer Key Objection - Answer key objection for Group-B Exam can be submitted from 14.04.2019 to 16.04.2019. The Answer Key of 2nd Grade Teacher Exam 2018 can be downloaded from here as the official answer keys are available on the official website. Candidates can download official Subject Paper Group-1 answer key as well as Subject Paper Group-2 answer key of Senior Teacher 2nd Grade Exam 2018 held in October-November, 2018. Answer Key Objection - Answer key objection can be submitted from 23.02.2019 to 25.02.2019. Answer Key of 2nd Grade Teacher Exam 2016 can be downloaded from here as the final official answer keys are available on the official website. Candidates can download official Subject Paper Group-1 answer key as well as Subject Paper Group-2 answer key of Senior Teacher 2nd Grade Exam 2016 held in June 2017 & July 2017. Answer Key Objection for the answer keys uploaded on 08.03.2018 for Sr. Teacher Grade II Exam 2015 held in Feb. 2018 can be submitted as per the schedule (13.03.2018 to 15.03.2018) till Midnight (with fee of Rs. 100 for each answer/question) at the official website of RPSC. Answer Key of 2nd Grade Teacher Exam 2016-17 can be downloaded from here as soon as the official answer keys are available on the official website. Candidates can download GK Paper 1 answer key as well as Subject Paper 2 answer key of Senior Teacher 2nd Grade Exam 2016 held in 2017 (April & May). GK Paper 1 of 2nd Grade Exam 2016 was held on 01.05.2017 for group 1 candidates who have opted for Social Science, Science, English & Punjabi as their main subjects. Official answer key of GK Paper 1 (01.05.2017) has been released by RPSC on 21.08.2017. Official answer key can be checked here with paper solution. Q. 1. Which of the following hills are situated in Central Aravali Range? Q. 2. Which is not a type of sand dune in Thar Desert in Rajasthan? Q. 3. What is the main source of pollution in river Luni? Note : Complete and official answer key has been uploaded here on 21.08.2017. GK Paper 1 of 2nd Grade Exam 2016 was held on 26.04.2017 for group 1 candidates who have opted for Hindi, Sanskrit, Maths & Urdu as their main subjects. Official answer key of GK Paper 1 (26.0.4.2017) has been released by RPSC on 21.08.2017. Official answer key can be checked here with paper solution. Q. 2. “Lasadiya Plateau” is situated in which district of Rajasthan ? Q. 3. Which of the following is not a Saline Lake ? Q. 6. What is the code given by Koppen for hot desert type climate in Rajasthan ? Q. 9. Which one is not an inland river of Rajasthan ? Note : Complete and official answer key is uploaded here. Solved question paper of GK Paper 1 of 2nd Grade Exam 2017 can be checked here very soon. GK Paper 1 (01.05.2017 & 26.04.2017) solution are solved question answers basis on the official answer key 2017 which will be further updated with official answer key. Answer Key of 2nd Grade Teacher Exam 2011 can be downloaded from here as the official answer keys are available on the official website. Candidates can download official GK Paper 1 answer key as well as Subject Paper 2 answer key of Senior Teacher 2nd Grade Exam 2011 held on 27.05.2017 & 28.05.2017. Answer Key Objection for the answer keys uploaded on 14.06.2017 for Sr. Teacher Grade II Exam 2011 held on 27.05.2017 & 28.05.2017 can be submitted from 17.06.2017 to 19.06.2017 till Midnight (with fee of Rs. 100 for each answer/question) at the official website of RPSC.